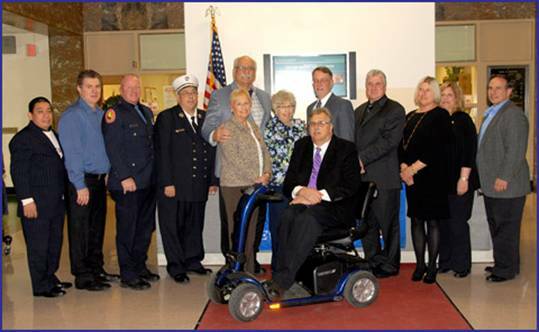 Nassau County Legislator Dennis Dunne Sr., attended the Levittown Public School 18th Annual Recognition Night for Community Service at Levittown Memorial Education Center in Levittown. Shown in photo: Polito Hernandez & Lance Wolf, Miller’s Ale House; NCPD Officer Robert Tedeschi; LT. John Gino, Levittown Fire Dept. ; Legislator Dunne; Eleanor Walsh, Kiwanis Club of Levittown; Polly Dwyer, Levittown School Dist. ; Mike Gunn, CSEA; William Mullan, Jr.; Tom Kohlman, Levittown Community Council; Celeste Watman, Levittown Public Library; Patricia Genco, Levittown PTA Council; and Gregory Geiger, Forest City Community Assn.